Abu Dhabi: The creativity and passion of 28 educators and institutions from across the Arab World were on Monday recognised in the capital at the 12th edition of the Khalifa Award for Education. More than Dh2.5 million was distributed among the 28 winners across 11 broad areas, including for excellence in Arabic language teaching, higher education, educational authoring and the teaching of individuals with special needs. Shaikha Azza Al Nuaimi, general manager of Humaid Bin Rashid Al Nuaimi Charitable Foundation, was recognised as the Educational Personality of the Year. Having begun her career in education, Al Nuaimi has been working in the recent past to spearhead charitable initiatives that support families, orphans and other people in need. 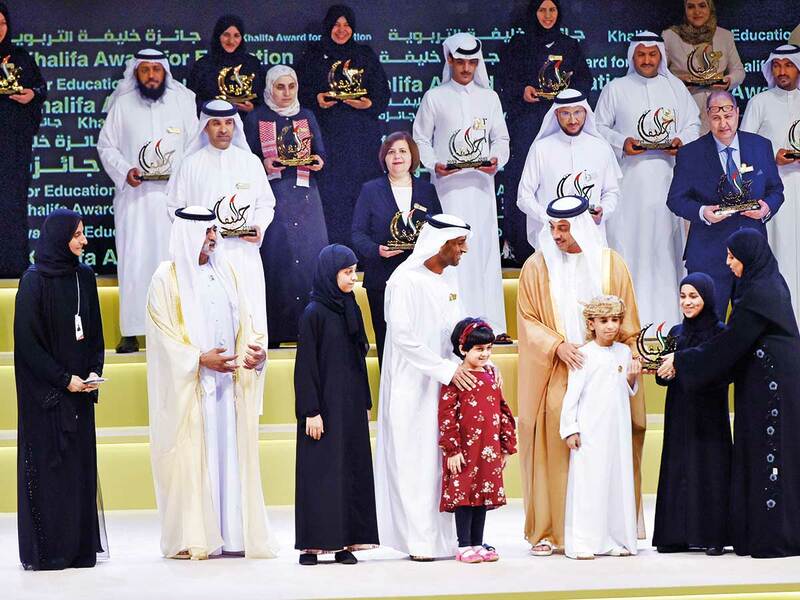 In addition to teachers, authors and institutions, four Emirati families were also honoured for their efforts to promote higher levels of education and knowledge in the country. The award ceremony at the Emirates Palace was attended by Shaikh Mansour Bin Zayed Al Nahyan, Deputy Prime Minister and Minister of Presidential Affairs, Shaikh Nahayan Mabarak Al Nahayan, UAE Minister for Tolerance, and other dignitaries. Since its launch in 2007, this award has encouraged those in schools, universities and social institutions to be creative and launch projects to support progress in the Arab world. “Since its launch in 2007, this award has encouraged those in schools, universities and social institutions to be creative and launch projects to support progress in the Arab World,” said Dr Amal Al Afifi, secretary general at the Award. Winners received a trophy, certificate of excellence, and a cash prize ranging from Dh75,000 to Dh200,000. I have been teaching Arabic to young boys in Grade 1 to 5 for more than two decades. I know it is difficult to keep their attention, so I develop games to keep the concepts interesting. In my opinion, we must utilise the available technological resources to make teaching interesting for today’s children. I teach Science to Grade 7 girls, and strive to use robotics and in-class experiments to make the subject engaging and fun. A child’s education should be holistic, and not just focused on academic success. I have always believed this, and encourage my children to pursue their passions. For instance, my 13-year-old daughter loves art, so we look for avenues to get her work published. In contrast, my seven-year-old son loves football, and we’re now setting up a field at our house so he can get the practice he needs to get better. This award is a real honour, and it encourages us to keep pursuing an all-round education for our children.